As part of its efforts to spur innovation and wane the economy off raw materials, the Russian government began awarding scientific “Megagrants” of up to $5 million to leading international scientists in 2010. Winners, which included Nobel laureate Ferid Murad (University of Texas) and Fields Medal winner Stanislav Smirnov (University of Geneva), were determined by independent foreign experts and a state commission. The researchers must use the money to launch projects at leading Russian universities and spend no less than four months of the year in the host institutions. This year, the second batch of 40 megagrant winners was announced. Among them was Osamu Shimomura, a Japanese organic chemist and biologist. 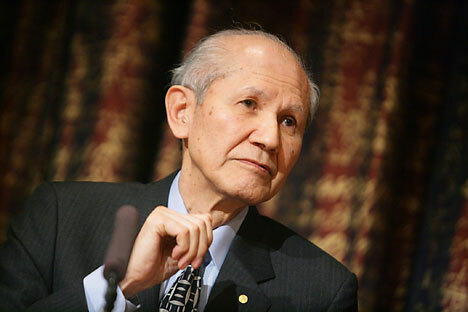 Shimomura was awarded the 2008 Nobel Prize in Chemistry, along with two American scientists, for the discovery of green fluorescent protein. He is currently Professor Emeritus at the Boston Medical School, but will soon apply his talents at Siberian Federal University in Novosibirsk, Russia. RBTH offers this following interview from Gazeta.ru. Gazeta.ru: Why are you interested in working in Russia? Osamu Shimomura: Despite the fact that many countries are doing research into the practical application of bioluminescence, fundamental chemical research in this field has ceased almost everywhere else in the world except Russia. My immediate area of research is the chemistry of bioluminescence, a field of fundamental science that can be used for applied research. In the past, Russian scientists contributed a lot to research into this phenomenon, including research of the photoprotein obelin. They’ve recently conducted remarkable research on Siberian glowworms. Gazeta.ru: How do you rate the standard of science in Russia today? O.S. : I can only speak to my area of research. Over the past few years, Russian scientists seem to have been the only ones publishing serious and noteworthy research on the chemistry of bioluminescence. I think Russian scientists are the leaders in the field of bioluminescence today. Gazeta.ru: Why did you choose Siberian Federal University? O.S. : An old friend of mine, Professor Iosif Gitelzon, academician at the Russian Academy of Sciences, invited me to work at Siberian Federal University. Given the situation in our field, as I described, I decided to accept his proposal and took this opportunity to work with Russia’s excellent scientists. Gazeta.ru: If you receive the grant, what will be the focus of your research? O.S. : We will research bioluminescent mushrooms. I think that explaining the mystery of bioluminescent mushrooms would be a major scientific breakthrough, and it could also be of practical use, although at this point, we do not know how.